How old is Lake Superior? What is the depth of Lake Superior? What are the Facts about Lake Superior? Questions begging for answers. Minnesota's Sea Grant program provides us some clues to the first question. The beginnings of Lake Superior trace back a billion years! . . . when molten basalt erupted in a rift from near present day Detroit stretching to Northern Minnesota. "Billions of tons of molten rock" accumulated deep beneath the earth's surface for 22 million years. Some point during this time period eventually the tipping point was reached where the surface of Mother Earth could no longer support the weight and the surface began to sink . 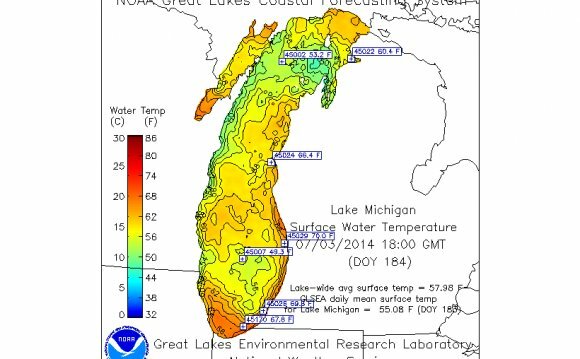 . . and the Lake Superior basin began to form. The basalt rock that formed this original basin is most apparent in the North Shore of Superior - in Minnesota and Ontario. Here Basalt outcroppings are abundant. (Learn more about Lake Superior Rocks & Agates here) Shallow seas flooded the southern portion of the basin and deposited sand and muck which eventually formed the sandstone formations found in the Bayfield Peninsula - Apostle Islands and Pictured Rocks National Lakeshore parks. That was 500 million years ago - according to the Minnesota Sea Grant research. This historical perspective on Gitchee Gumee reminds me of a book most fascinating, combining more in depth geology with tourism exploration, I found at the bookstore in Ontario's Lake Superior Provincial Park: "Roadside Geology of Ontario: North Shore of Lake Superior." I discovered it near the end of the northern leg of our last circle tour trip, but next time it will be among my guide books for the journey. Some of the oldest rocks in the world exist along the Lake Superior shoreline in Ontario. What's the depth of Lake Superior? For some time reliable sources claimed 1332 feet. But more recently that figure has been revised to a little under 1300 ft. What explains the difference? Silting in of the deepest hole? More sophisticated measuring technology? Dunno. Yet this fact remains: Whether 1333 feet or 1295 feet deep, it contains more water than all of the other Great Lakes combined! And it accounts for 10% of the world's surface fresh water. This surface area (31, 700 square miles) is greater than the combined acreage of the states of Vermont, Massachusetts, Rhode Island, Connecticut, and New Hampshire. Lake Superior is the largest freshwater lake in the world, based on surface area, and the third largest in volume exceeded only by Lake Baikal in Siberia and Lake Tanganyika in Africa. There is enough water in Lake Superior to cover the entire land mass of North and South America with a foot of water! The average underwater visibility of the Lake is 27 feet and in some parts of the lake it is 100 feet! Suffice to say it is the cleanest of the Great Lakes. Water comes into Superior from over 300 streams and rivers and exits into Lake Huron via the St. Mary's River - which by the way 2000 years ago was more of a channel than a river because at one time the levels of Lake Huron and Lake Michigan were higher, much closer to the level of Superior than they are today. Unfortunately levels in Lake Superior have been falling recently with evaporation taking more out than the streams, rivers, and springs put in. An interesting fact you might not think would make a difference - warm winters where the lake doesn't freeze over also hurt the lake - because the open water allows higher evaporation. And as you'd expect lower levels of rainfall in the summer hurts too. Lower snowfall in some recent winters haven't helped either.